Become More: Italy and beyond: Cold fusion - a breakthrough in Bologna? Thanks to my friend Massimo, I've been privy to some exciting, possibly revolutionary news from Bologna. Most people are unaware that some extraordinary experiments are going on with a machine that can generate energy from cold fusion (fusione fredda). Cold fusion is a type of nuclear reaction that occurs at low energies or temperatures. The invention, called the E-Cat machine (energy catalyzer), was developed by Dr.Andrea Rossi , an entrepreneur, and is now undergoing worldwide scrutiny after a successful test of the device was run on October 28 in Bologna. I first heard about Dr.Rossi's experiments from Massimo in March, but due to the skepticism that has been a constant factor in the reports coming from Bologna, little mention of it has been made in Italy or the rest of the world. 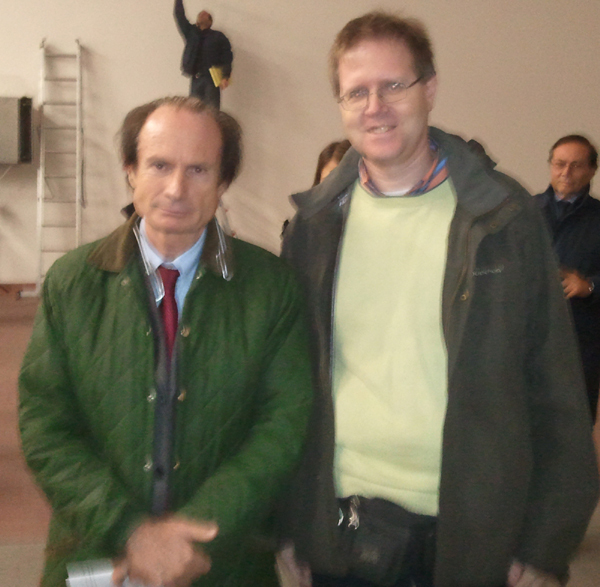 (In fact, Massimo is the only one of my Italian friends who had heard about it.) However, Dr. Rossi performed a test a few days ago that has won over many of the skeptics and it now looks like his invention has the potential to change the world as we know it. Still, Rossi is viewed as either a madman or a genius, and there are many unanswered questions about his invention. Is it a scam or the real deal? Chissà? Only time will tell. Massimo was present at the test last week, had his photo taken with Dr. Rossi, and can be seen in the background with his wife Sofia in several news videos that are online. They were even visible in one shot on the national news televised in Italy. Perhaps some day soon he can say that he was a witness to history in the making. Since science isn't my field, I won't attempt to explain how the E-Cat works, and I have not been able to fully comprehend the implications that this invention could have for the world. But some say that if Rossi's invention actually works, it will be the most important invention in all of human history.